Michigan tips off the Big Ten Tournament with a 2:30 matinee versus Iowa (again). Michigan and Iowa have become quite familiar with each other of late. This will be the 9th time that these two programs have faced off in the last three years. Michigan is 5-2 in the last seven contests, going 2-1 each year. The old adage “it’s tough to beat a team three times” certainly comes into play here. 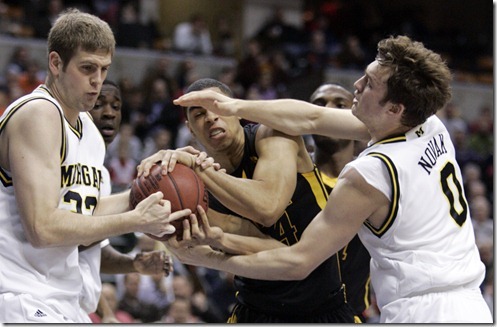 Michigan swept the season series but judging by the game in Iowa City, the Hawkeyes seem to have figured out the Michigan defense. Iowa scored 1.18 points per possession in that game, the third worst defensive performance of Michigan’s season. Aaron Fuller was simply dominant in that contest. Fuller scored 30 points on 11 of 13 shooting and also pulled down 13 rebounds. Michigan needs to figure out a way to slow down the versatile power forward or they could be looking at a long day. If they do manage to stop Fuller, they should have a great shot to win the game as Iowa’s options beyond Fuller are limited. The one other player to watch out for is Matt Gatens. Gatens also played very well in the last match-up (21 points on 8 of 13 (3-6 3pt) shooting with 8 rebounds, and four assists) and Michigan will have to do work to slow him down. Gatens three point shooting is down from last year (34% from 40%) but he is still dangerous if he gets going. He also is one of the few Iowa players that has the ability to take the ball to the rack if you over play him. For Michigan, it’s all about DeShawn Sims. Over the last two years (6 games), Sims averages 21 points and 7 rebounds while shooting 50% from the field. His performances have been highlighted by a game tying three in Iowa City earlier this year and also his monster performance in the Big Ten Tournament last year in which he single handily punched Michigan’s NCAA tournament ticket. Sims will need to bring his A-game which we haven’t seen nearly as often as we did in January. Iowa’s strengths and weaknesses as a team haven’t changed much since the last game. Their offense has really struggled, they have the second worst offense in the Big Ten at .94 points per possession in conference play. They even shoot the ball worse than Michigan with a shooting line (2pt/3pt/eFG) of 42.04/30.1/46.4. They turn the ball over on 22.3% of their possessions in conference play and only Indiana does a worse job holding onto the ball. While their offense has been decidedly mediocre, Iowa’s defense hasn’t been any better. Iowa does do one thing well: defend the three point shot. 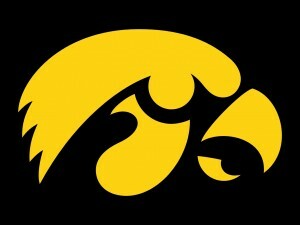 Big Ten opponents shoot only 32.8% from three point range versus the Hawkeyes, second best in the conference. The Hawkeyes’ field goal defense is below average and they give up a ton of good looks from two point range. They don’t force many turnovers but they do manage to keep opponents off the free throw line. Considering Iowa is one of only two teams that Michigan swept this year, the Wolverines are clearly capable of beating them. Anything can happen in a conference tournament game though and it will come down to whether Michigan executes. At this point no one knows what to expect from this team on any given night. This is most likely the final weekend in one of the most disappointing Michigan basketball seasons in quite some time. It’s a crapshoot how they react… They could go on a torrid winning streak like Baylor last year and come up just short. Or they could go out with barely a wimper and lose to Iowa. I wouldn’t be surprised at any outcome but the stats do point toward Michigan. Pomeroy likes Michigan by 7 with an 82% chance at victory while Vegas is even more confident and likes Michigan by 8. Let’s hear your thoughts and predictions in the comments.